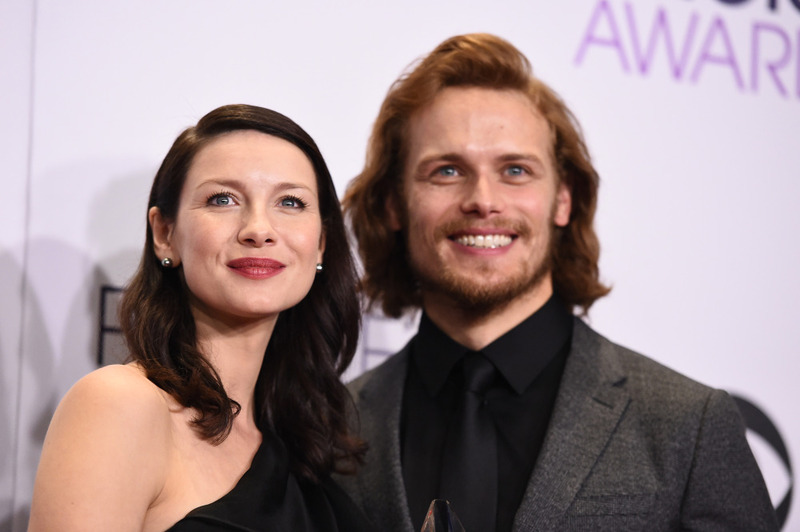 Caitriona Balfe and Sam Heughan at the 2015 People's Choice Awards. . HD Wallpaper and background images in the Outlander 2014 TV-Serie club tagged: photo outlander season 1 caitriona balfe sam heughan claire beauchamp jaime fraser pca people's choice awards 2015. This Outlander 2014 TV-Serie photo contains geschäftsanzug and business-anzug. There might also be gut gekleidete person, anzug, hosenanzug, pantsuit, anzug, anzug der kleidung, porträt, kopfbild, nahaufnahme, portrait, headshot, and kopfschuss.